Finding out you are pregnant can be one of the most beautiful moments of your life. 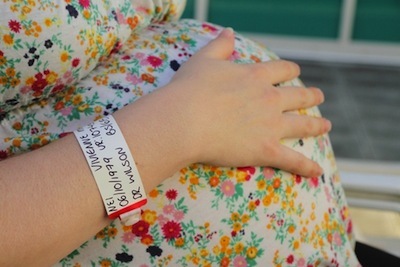 Finding out you have cancer during that pregnancy can be one of the scariest. As the average age of pregnancy is slowly increasing, so are the rates of pregnant women being diagnosed with various forms of cancer. If the cancer is non-aggressive, stage 1 cancer, doctors may give the woman time to give birth before starting any form of aggressive treatment (if aggressive treatment is needed). But, if the cancer is in the latter stages and chemotherapy is the only way to save the woman’s life, there may not be time to wait. Having chemotherapy during pregnancy was once thought to be detrimental for the fetus, but that is no longer considered to be the case. Women with advanced cancers are having chemotherapy during pregnancy and giving birth to healthy, unaffected babies, right on time. Minnie understood the things she would have to give up during pregnancy. She knew her doctor wanted her to stop the caffeine and eliminate alcohol all together. She was not supposed to eat raw fish, so sushi was out of the question. What she did not expect was chemotherapy. Minnie was diagnosed with a form of stage 4 lymphoma during her third trimester of pregnancy. She needed chemotherapy immediately, but feared the potential negative effects on her unborn child. When Minnie approached her doctors about her pregnancy concerns, she was surprised to find out she was not alone. Her doctors told her that thousands of pregnant women are treated with chemotherapy every year and that pregnancy outcome is not affected. Treatment options for pregnant women with cancer used to be limited and pregnancy outcome often took a backseat to treatment. Many women were forced to choose between their life and the life of their unborn child. Fortunately, treatment options today continue to grow and evolve, and pregnant women with cancer are no longer always forced to make that decision. Source: PBS.org. May 17, 2012.